Five students enrolled on the 12-week Prince’s Trust programme have given a community centre playground a new lease of life. The group from the College of Haringey, Enfield and North East London spent one week working at Play Space, a voluntary-run under-fives community centre playgroup that has served families in North London since 1992. The students repainted the building, doors and gates, renovated benches and also did a spot of gardening, removing weeds and tidying up plant troughs. Part of the Prince’s Trust programme required students to take part in a community project and, after searching for a worthy cause, they decided to support the Play Space centre. They raised money for equipment they needed for the project by setting up a stall and selling tea hampers and Fair Trade chocolates. 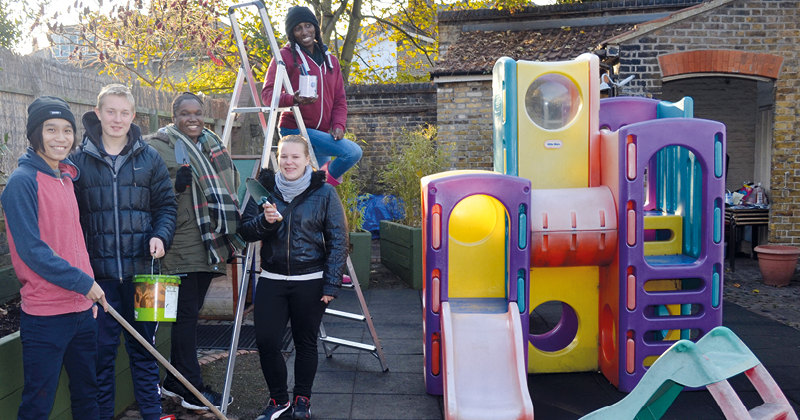 Featured picture: (L-R) Students Tung Le, Jordan Williamson, Aisha Pittie, Andrea Baki and Rushelle Angus at Play Space in Wood Green.